A wheelbarrow can help make transporting items around your yard or work area much easier. Indeed, can you imagine how much easier it would be to transport sod or dirt in a wheelbarrow than personally carrying these items? Because the wheels of the wheelbarrow carry the weight of the load, it saves your back from being over-strained and reduces the amount of physical labor. When using a wheelbarrow, you can get more work done in a short amount of time than without using a wheelbarrow. 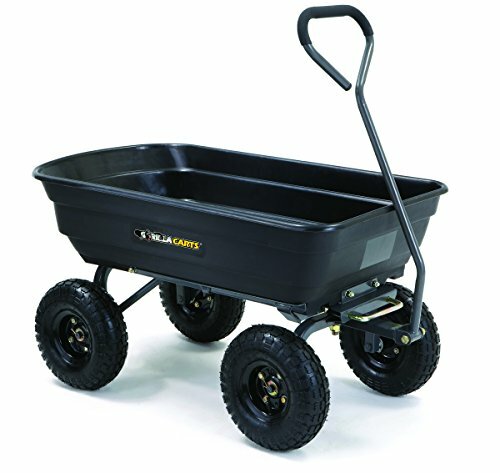 I am going to share with you different types of wheelbarrows including what kinds of material they are made of, how many wheels you need and the types of materials wheels are made of, handles, tray sizes, stability and turning radius, and colors to consider when purchasing your own wheelbarrow. I will discuss the advantages of buying a wheelbarrow along with considerations to take into account when purchasing your own. In the chart below, you will find our top 10 rated wheelbarrow options. For a more in-depth review of each model, please click on "Read Review." There are many different types of wheelbarrows and at first glance, it can be quite overwhelming when you are considering which type to purchase. Wheelbarrows are made of different materials, they have differing numbers of wheels and different types of tires. I have included a section later on in this article about choosing the right kind of wheelbarrow tire. So let's start by learning about the different materials from which wheelbarrows are made. One nice feature of plastic or poly tray-type wheelbarrows is that they are very lightweight. This can make transporting loads much easier for you. Plastic wheelbarrows will not rust like their metal counterparts and are also cheaper to buy than other types of wheelbarrows. A negative aspect of plastic wheelbarrows is that they are not as durable or heavy duty as metal and can crack easily when left outside unprotected and uncovered. If you want a durable, strong, heavy-duty wheelbarrow, you will definitely want to buy a steel wheelbarrow for moving loads. Unlike plastic, steel will not crack and will last for a long time. Although steel may rust over time, a rusty wheelbarrow is still functional, unlike a cracked wheelbarrow which cannot be used. To prevent your wheelbarrow from becoming rusty, do not store it outdoors, sand and repaint it every few years. If your steel wheelbarrow becomes rusty beyond use, you can use it as a decorative feature in your yard or reuse it for other purposes. However, because a steel wheelbarrow is so heavy-duty and durable, it should be able to be used for several decades or more when properly cared for and stored. 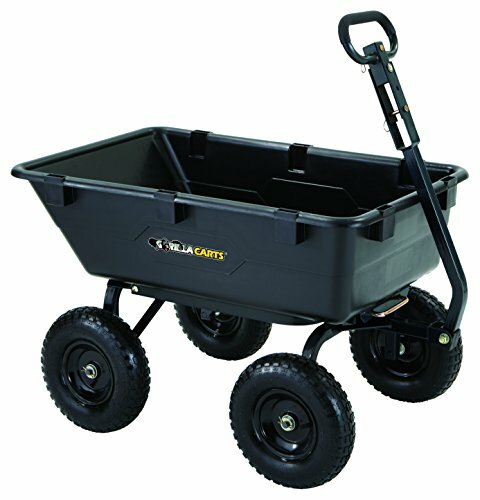 If a traditional wheelbarrow is hard for you to push, perhaps a motorized wheelbarrow would be a better option for you. 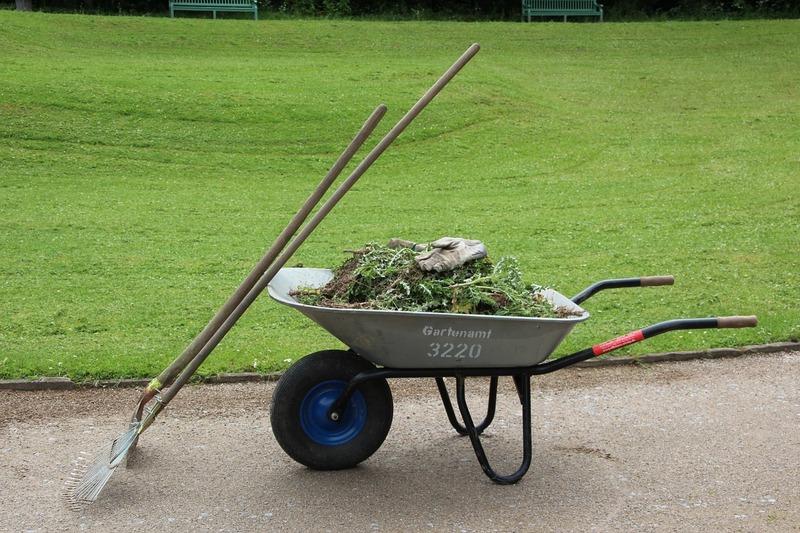 A negative about this type of wheelbarrow is its expensive price tag, and it may not work well for some gardeners who simply need a wheelbarrow that is easier to push smaller loads. But if you find you are hurting yourself while pushing your wheelbarrow, or if it is uncomfortable, a motorized wheelbarrow may be a good choice for you. You may also want to consider how many cubic feet you will need your wheelbarrow to accommodate. For smaller areas, a motorized wheelbarrow may be unnecessary and purchasing another type will save you money. Depending on what your needs are, you will want to choose a wheelbarrow that is appropriately sized. Some trays are smaller and more shallow, some trays are deep and come as large as eight cubic feet. Obviously, the bigger the wheelbarrow, the more expensive it will be to purchase. The traditional wheelbarrow has one wheel. This allows for a great turning radius and is ideal when used in tight places. A downside is that a one-wheel/single wheel wheelbarrow is not as stable as a multiple-wheeled wheelbarrow. It requires more balance, and can easily tip if you are moving or carrying heavy loads. A two-wheel wheelbarrow is more sturdy than a one-wheel wheelbarrow. It is designed with both wheels up front. Seldom will you find a wheelbarrow with one wheel in the front and one wheel in the back. The advantages of a two-wheel wheelbarrow are that it can be easier to push, and requires less effort to move. However, it may not fit into tight quarters, it does not have the small turning radius that a one-wheeled wheelbarrow has, and it may tip over more frequently. A three-wheel wheelbarrow is designed with two front wheels and one back wheel. With the extra wheel in the back, this wheelbarrow is balanced and stable. Because it is very stable, there is less of a chance of it tipping over. If you are wanting a stable wheelbarrow, the three-wheel wheelbarrow is the best wheelbarrow. However, this type of wheelbarrow does not have a tight turning radius. Four-wheel wheelbarrows are often called carts or wagons. It is highly unlikely that a four-wheel wheelbarrow will tip over. Most four-wheel wheelbarrows are designed so that it is like a small cart or large wagon and is usually pulled by a tractor or truck instead of pushed. However, some four-wheel wheelbarrows are designed so that they look exactly like a one-wheel wheelbarrow, but they have four wheels instead. This type is pushed just like a regular wheelbarrow, but instead of having the back leg as support, it has two small wheels. If you choose to buy a four-wheel wheelbarrow, it is very sturdy, stable, and easy to transport heavy loads. If you will be carrying items more than a few feet, a wheelbarrow can help make carrying much easier. It also allows you to carry more items. Whether you are pushing or pulling a wheelbarrow, a wheelbarrow can still be very helpful and put less strain on your body. If you have a garden, a wheelbarrow can be very helpful. It can help carry soil and plants to your garden or help transport your gardening tools to the garden. Whatever your case may be, a wheelbarrow is very helpful and can be used in many different ways. If you have farm animals, a wheelbarrow is particularly. Wheelbarrows can be used to dump manure, bring hay or other food to your animals, move small animals to other locations, and transporting small farm tools. If you don't like one particular type of wheelbarrow, there is a good chance you will find one that you do like because there are so many options available on the market. With different materials used to make wheelbarrows and different wheel types and the number of tires available, colors, and designs, you will most likely find a wheelbarrow that you like and that will best suit your needs. Although a wheelbarrow is made to last a long time, when your wheelbarrow becomes old, rusty, or cracked, it can be used as a fun way to use decorate in your yard or garden or on your front porch, patio, or deck area. Some people like to plant flowers in their old or rusty wheelbarrow. Other people like to put old garden tools into their wheelbarrow to create a vintage look. Another idea is to put hay bales or straw bales around the wheelbarrow to create a fun, festive look to your yard, garden, or the outside of your home to decorate for the holidays. Use your imagination and be creative. If you are considering buying a wheelbarrow, you may feel overwhelmed by all the options. 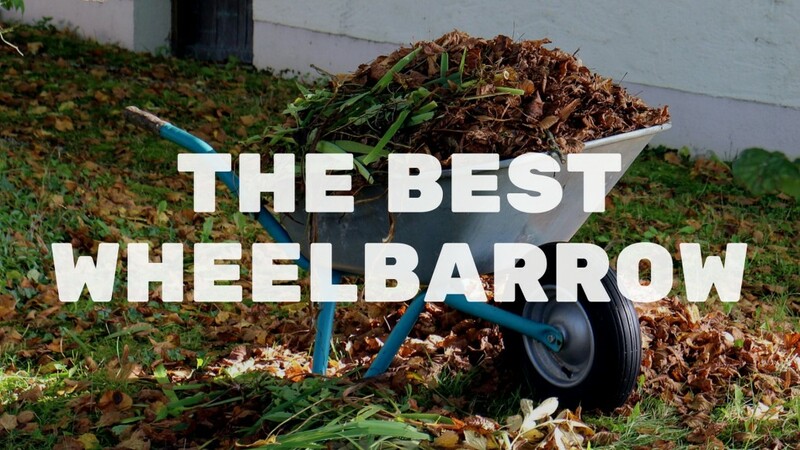 You may have many questions you need to be answered in order to find the perfect wheelbarrow for you. Although there are indeed many considerations, most are very simple to answer and can help prepare you when purchasing your own wheelbarrow. I have included a list below of questions to ask yourself, and hopefully, they will help you find the perfect wheelbarrow for your personal needs. What Type of Terrain Do You Have? Some wheelbarrows are not designed for working on rocky terrain. If you will need a heavy duty wheelbarrow that can go over rocky or mountainous places in your yard or garden, you may need to use a three-wheel wheelbarrow. Three-wheel wheelbarrows are designed to work well on uneven ground, so consider this type of wheelbarrow to see if it will fit your needs. If you will be using the wheelbarrow on flat ground, a regular wheelbarrow will work better for you. How Much Room Do You Need in the Tub? If you will be loading large, heavy items, you will need a larger, heavy duty tub. Each wheelbarrow is sized differently, so make sure you find one that will fit your particular needs. What Type of Tire Do You Want? There are three different types of tires to consider when purchasing a wheelbarrow. They are pneumatic, semi-pneumatic, and non-pneumatic. Later in this article, I will explain the differences between these types and what the purpose of each tire is. Both pneumatic tires and non-pneumatic tires are great for heavy loads and rough terrain. However, the pneumatic type requires air and runs the risk of going flat, while the other two types do not require air and do not get flat tires. Consider which type of tire will work best for you and your lifestyle. Do You Have Room to Store a Wheelbarrow? Not everyone has enough room to store a wheelbarrow. If you find you are short on room, but still need a wheelbarrow, perhaps you should consider buying a wheelbarrow that folds up or converts. Foldable wheelbarrows can be hung which saves on floor space. But if you would rather have a regular wheelbarrow that does not fold, consider beforehand where you will store it. A storage shed or garage is an ideal place to store a wheelbarrow. Make sure to store your wheelbarrow where it is out of harm’s way, yet still accessible and easy to retrieve. The price of a wheelbarrow will depend on the type, size, and quality you buy. You may be able to find a wheelbarrow under $100, but a good quality wheelbarrow can cost approximately $500. Consider how much money you are willing to spend so that you know what is available to you in your price range. It will save you time as you find a wheelbarrow that will work for you. What Color Wheelbarrow Do You Want? The color of the wheelbarrow may be as important to you as its durability. Consider what color you want before you purchase your wheelbarrow. Wheelbarrows come in just about any color you can imagine: red, orange, yellow, green, blue, purple, pink, black, grey, and the list continues. Make sure to take the time to pick the color you like so that you are happy with your purchase. Do not overfill your wheelbarrow. Bend your knees when you lift your wheelbarrow, so your legs do the work instead of straining your back. Keep your back straight when lifting and pushing a wheelbarrow. If your wheelbarrow starts to tip over, let go of it. Do not attempt to get in the way of a falling wheelbarrow. Take care when pushing the wheelbarrow so that it does not tip over. It is easier to carry a heavy load with a wheelbarrow. It is a great gardening tool. It is helpful with livestock chores. It can take up a lot of storage room. Some wheelbarrows can be expensive. Some can tip more easily and are hard to maneuver on rough terrain. Tires are a very important feature on wheelbarrows. Without the tire/tires, there is no way to operate the wheelbarrow. The most common type of wheelbarrow is the type with one wheel in the front, but you can also find wheelbarrows with two wheels, three wheels, or even four wheels. A four-wheel wheelbarrow is usually called a cart. Besides the different numbers of tires on wheelbarrows, there are also different types of tires. There are mainly three kinds of tires: pneumatic, semi-pneumatic, and non-pneumatic. Pneumatic tires are similar to bicycle tires and they have air tubes inside. This type of tire is great for those who need to use it on rough terrain or stairs. A downside to this type is that there is a chance of it going flat. Semi-pneumatic tires are lightweight and they will not go flat. Another nice feature is that there is no air needed in the tire. Unfortunately, these tires are more difficult to find and are not as common as other tire types. Lastly, there is the non-pneumatic tire, also called an airless tire. This tire is made of rubber and will not go flat. These types of tires can handle heavy loads without requiring too much effort from you. The more tires on a wheelbarrow, the more sturdy it will be. A downside to having more tires is that you will not be able to make turns as easily. A two-wheel wheelbarrow is a good option if you are wanting the wheelbarrow more stable and to be able to turn more easily than a four-wheel wheelbarrow. The handles on your wheelbarrow should be easy to grip and push. Some handles are made of wood and others are made of steel. Straight handles are easy to control and can help make dumping things easier. However, they do require more arm and shoulder strength. Closed handles and single handles may be easier for you to push. Consider handle types when purchasing your wheelbarrow. 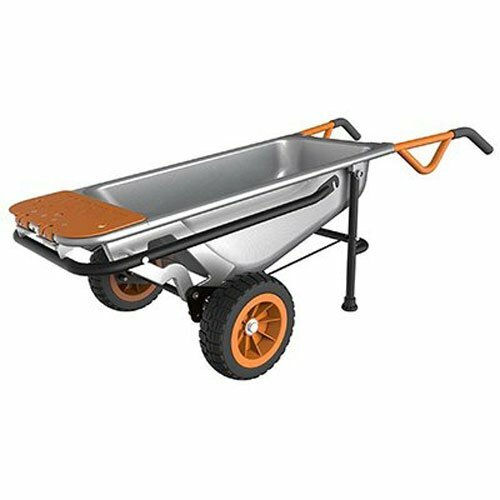 Our top pick for the best wheelbarrow is the Worx Aerocart Multifunction 2-Wheeled Yard Cart. Whether you live in the city, the suburbs, or the country, I hope I have shown you the value of a wheelbarrow for your home. I have covered many items that you should consider when purchasing a wheelbarrow for your use. Think about what the purposes are for your wheelbarrow, as well as the number and type of wheels, the size and type of the tray, the type of handles, and your desired color, as well as the price that you are willing to spend. Using the knowledge you now have about wheelbarrows, have fun picking out a wheelbarrow that will fit your needs and get to work!